Rivers State pride itself as one of the richest states in sub saharan Africa with a large population of over 30 million people and seats as one of the major economic hub in the country hence the need for all round leader that will bridge the gap between the peoples wish and reality.We are above fifteen million young, healthy persons in Rivers State unemployed? Why has quality infrastructure eluded Rivers people? Why is the healthcare system in the State in a shambles different from what is portrayed in the pages of newspapers and on the television? Why has poverty become almost endemic in an entity as richly endowed as Rivers? Why has education taken a nosedive in our State? Why can't our arable land yield bountifully again? The answer to all these lies in the failure of governance in Rivers State.what different people making unkept promises after electioneering process and stealing of the people's mandate.Then, what can we do to arrest this poor governance? 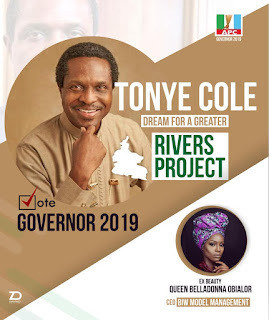 A rebirth is the answer, and Sir Tonye Cole a veteran Billionaire business mogul has formulated a comprehensive blueprint to bridge the gap and summon courage to wipe the taers of the masses and move Rivers to the Next Level with the Greater Rivers Initiative to midwife the rebirth yearned for. It is not all hopelessness. We have a lot of human and natural resources that can help us reinvent ourselves. We can permanently keep the unemployment wolf out of Rivers State by making simple investments in the production of particle board. Sawdust and woodshavings are the main raw materials required for the production of particle board. It involves mixing sawdust and woodshavings with resins and running it through a hotpress. This is the main input for 80% of global office and hotel furniture. Yet, at the Timber Dealers, Saw Millers and Allied Business Market, traders are charged for collection of sawdust and wood shavings which are gathered into a landfill and burnt! What an irony! Tonye Cole the APC Governorship Flagbearer and Governor- in -the Waiting come 2019 with your support will vigorously pursue the up-skilling and building of human capacity and improvement of all aspects of financing and access to finance by SMEs through deliberative actions and interventions. A key priority will be to unleash the energy of the entrepreneurial spirit of Rivers people who are known to be great innovators. The LGA structure in Rivers State as presently constituted is not accountable as it is structured for rent-collection. The culture of transition in perpetuity must be discarded for the State to make progress and alleviate the pains of the grassroots. A properly constituted LGA structure is one that is elected through the ballot. Once people have to face the electorate, they become mindful of scorecards to brandish. A reformed state administration as conceptualized in line with the APC Manifesto will energize the LGA structure and create performance metrics that will guide operators of the system and revolutionize development in the remotest of our communities. Rivers State shall establish Forest Reserves and re-introduce Forest Guards to control logging and tree felling activities. Urban renewal will be redefined from the current concrete jungle mindset to the more environmentally-friendly tree-lined boulevard concept, more aesthetically pleasing and far less expensive. Rivers State can create jobs through State Capitalism which means that the state acts as an investor by creating new State-Owned Enterprises (SOEs) that operate according to private sector mechanisms, and are based on sound business plans and are entirely independent of government. The State's infrastructural challenge can be used to create jobs by engaging 100% homegrown talents from among the pool of unemployed graduates and artisans. Rivers State will reticulate her capital within her own territory and at the same time engage local skills and in the process build long-term capacity. Rivers State is not beyond salvation. We have another opportunity to reinvent the State and harness our vast natural and human resources to the benefit of all. We desperately need a leader that will run a transparent, accountable and value-for-money administration with zero tolerance for corruption, ineptitude and cronyism. This alone will free up huge resources that will be applied to harnessing our virtually limitless potentials.the greater rivers initiative project Is Now! Let's support Tonye Cole to take us to the promised land.